Packaging includes; AC/DC 12 volt UL, Class 2 power transformer. 6kV surge protected (IEEE587 for category B3 devices). DOCSIS® 2.1 (D2) & 3.0 (D3) cable modem compatible. Local or remote DC powering via coaxial cable. Power insert sold separatly. 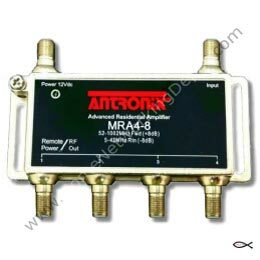 Provides 8dB of forward gain from 54Mhz - 1Ghz. Passive return band 5-42Mhz (for proper cable modem operation). Compensates for insertion loss of multi-output RF splitters. Intergrated IC, GaAs FET, very low noise. Device typically used in satellite low noise LNBs. Temperature harden capacitors all ports. Operating range -40 to +140 degrees F.
Patented CAM-PORT™, SCTE compliant F-ports are made of machined brass, nickel plated & water sealed to 15 PSI all ports. Patent pending magnetic resistant ferrite cores provide excellent digital transport charteristics for video, data and telephony services. 2. Includes the loss of internal diplex filters. 3. Measured on RF IN Port. 4. Measured on RF OUT Port. 5. 110 CW NTSC Channels loaded from 50-750Mhz. Digital carriers at -6dB as related to analogy channels. Bandwidth of placement 750- 870Mhz. 6. Forward; Chrominance to Luminance Delay (ns); 55.25Mhz, 67.35Mhz & 77.35Mhz. One (1) year exchange warranty from manufacturer, Go to www.ANTRONIX.net, US only.